I always wanted to learn how to program mobile devices. During Christmas holidays the government of Upper Austria called for mobile apps using their OpenGovernmentalData. So, the chance was taken and Kathi and me started to design an Android app. Actually it is an hybrid app. This means that you develop your complete app as an HTML5 project and bundle it with a small server. The result is a valid android APK which behaves like a native app. The advantages are that the toolkit we used to generate the package (Apache Cordova) is capable of producing running binaries for a whole bunch of operating systems, including Windows 7, BlackBerry, Symbian, WebOS, Android and, if you can afford it, iOS. Sinc we can’t pay 100$ per year to be allowed to just push the Quiz to the AppStore, there is no version for iPhone. Since we both own Android devices, the app is optimized for Android devices. Still, there were some difficulties. First, we had to decide on a framework. jQuery Mobile seemed to be a reasonable choice at that time since it is well known and I already are used to default jQuery. Next time, I will go with a toolkit supporting any kind of MVC architecture that avoides usage of HTML whenever possible. One of these would be e.g. Kendo UI. But we chose jQuery Mobile and stuck to it. The size of the toolbar at the bottom was a perculiar problem: While it was easy to adjust the size of the font depending on different screen resolutions of different devices, the toolbar would not change its display height. We decided that despite its fixed behaviour it will be usable in any case, even when being very small and optimized it for the lowest screen resolution we could find. This means the app runs on even very small devices. The map background is variable in size and automatically adjusts to the display size. The questions are generated out of OGD and OSM data. The most work was not to generate the questions which was mostly a case of combining a fixed phrase with a word describing a location, but to manually filter these questions for plausability. It just does not make any sense to let the quiz ask for a very small mountain which only a few people of Austria know by name themselves. 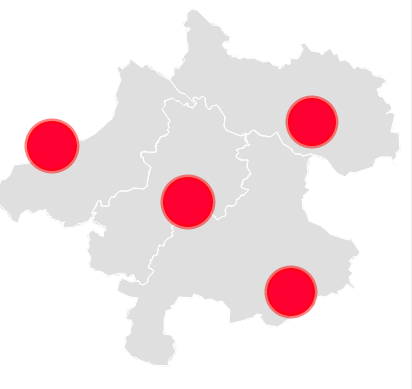 The same goes with lakes – in this case we filtered by their area. It was a fun project and I find myself playing the quiz which is a good sign. Kathi and me, we already have ideas to extend the OÖ Quiz and even have plans for a quite advanced second version with multiplayer support – it depends on our free time whether we will implement it or not.